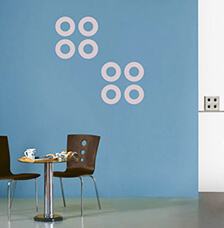 A range of stencil-based designer wall accents that recreate the exciting patterns of life. Carefully selected stencil themes for a quick make over for your beautiful home. Inspired by Pacific which is completely surrounded by Ocean, this pattern brings the sea life to your walls. Inspired by modernity & discipline, the array of bricks will brick the feeling of a neatly stacked zone. Insipred by nature, this pattern adds wings to you mood and make you feel free just like a butterfly. Inspired by modernity, these cicles adds different perspective what what a simple shape can do. 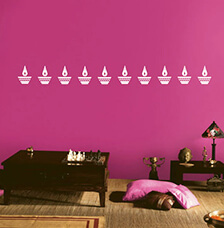 Inspired by traditional India, this design add a pious mood to the walls. Inspired by nature, these fern leaves add a tinge of garden effect to your walls. Inspired by modernity, the frames have a mix of curve and strights which gives a style unmatched by regular squares or circles. Inspired by pacific nature, hibiscus adds the freshness of pacific to the walls inside your room. 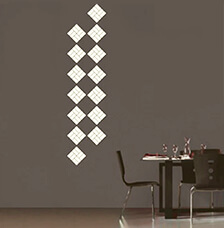 Inspired by the tech savy world, these letters drop from the computer straight on you walls decorating them. Inspired by modernity, the cicles that align to form variuous patters as per your wish, can add a sense of sophistication to your walls. Inspired by Indian tradition, these patterns can bring in the satisfaction of meditation on your walls. 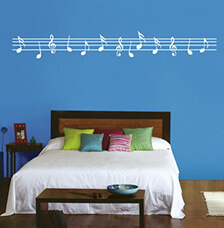 Inspired by modernity the notes can spill on your walls and create the enthusiasm that music only can create. 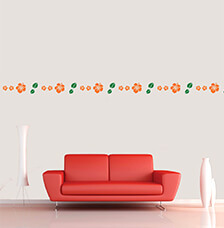 Inspired by nature, the flower of romance, Rose can add the essence of love and affection on your walls. Inspired by modernity, this pattern can create a sense of inquisitiveness to the room. Inspired by pacific tradition, the Traditional Tapa can either add a atmosphere of Culture or sophistication depending on the pattern you choose. Inspired by modernity, this design can bring a sense of self discipline and organised feeling of a library in your rooms. Inspired by indian tradition, these unique designs can instill a charecteristic aura of Indian heritage. 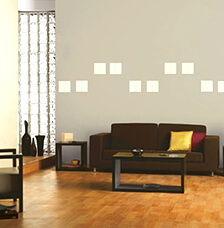 Walls should be smooth painted with the desired color of your choice. A grid of 300mm X 300 mm to be drawn using chalkline to decide on the position of the stencils. Carfully place stencils are per instruction given on the pattern you have choosen. 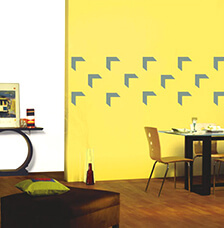 Stick the stencil to the wall using masking tape at the corners of the stencils. Using a 100mm sponge roller, apply Fortuna Silk Luxury interior finish with the color of your choice to cover the open area of the stencil. Allow to dry for 2-3 hrs, remove stencil. Using a pencil brush and the base coat color, carefully touchup portions which has any smudges.